Spinach is a super food loaded with tons of nutrients in a low calories package. We make smooth and on-time deliveries of the product range that we keep safe in our capacious inventory. In order to deliver an exceptional lot of products, we make use of the finest grade material for producing them. Our client can avail high quality Palak Powder. These are made in perfection with the worldwide approved requirements of quality and strength, these are strongly suggested and required. 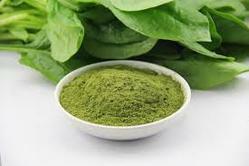 We are the leading manufacturers of Palak Powder (Spinach). We are leading manufacturer and supplier of spinach powder. - Green, leafy spinach is one of the world's healthiest vegetables. - Available in natural green color. - Size options of 80 to 120 mesh. Palak Powder is prepared at our modern machining facility by using fresh palak under the observation of food inspectors and chefs. In addition, to retain the original quality and freshness of the powders, these are packed in quality packaging material.